Warm weather brings lots of joy, fun, and natural treats like juicy watermelon, or a cold glass of fresh squeezed lemonade. These summertime treats won’t be around once winter arrives, so enjoy them while they last. But there’s something else that comes with the arrival of summer, and it’s something you want to avoid: mosquitos! These annoying insects LOVE to bite your skin. During the 1950s, the chemical known as DEET became the standard in mosquito and tick repellant. Labeled by the Center for Disease Control and Prevention (CDC) as “safe,” DEET is today’s most popular and effective way to counter summer insects. But is DEET really safe? Most sources say it is, but DEET is unnatural. You’re always taking a dangerous risk when using chemicals on your body, around pets, and on/ around children. That’s why many people are turning to natural solutions to avoid mosquito and tick bites. Here are our favorite natural ways to repel annoying summertime bugs and for mosquito bite prevention. 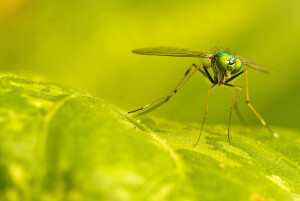 Mosquitos have trouble flying in fast-moving air. If you can create consistent wind around you by using a fan, doing so will lower the chances of mosquito presence. Planning a trip or a picnic? Check the wind conditions for your destinations. A small difference in wind speeds can make a big difference in the amount of bug bites you’ll find later. Citronella is an essential oil made from a plant called Cymbopogon (lemongrass). This natural repellent can be found in spray form, lotions, and candles. When applying a citronella-based repellent to your skin, remember to reapply every 45 minutes for maximum effectiveness. Mosquitos don’t like smoke or strong smells. If it’s too hot to start a fire, you can burn candles or use an essential oil burner to drive away these flying pests. Essential oils come in many varieties, including lemongrass, orange, and rosemary. Not only will these oils repel mosquitos, they’ll also emit a pleasant fragrance around your table, picnic, pool, or relaxation in the yard. Mosquitos like water. You can take advantage of their affinity for water and create a water trap to catch these bugs. To make your own, place a dish out in the open filled with soapy water. The mosquitoes will relocate to the water, and the soap will trap them in the dish. We hope these natural ways to repel mosquitos help you avoid annoying, itchy bites this summer. If you’re looking for a natural mosquito repellent product, the Carolinas Natural Health store has a few options. Visit our online store or give us a call at (704) 708-4404 to learn more about them!